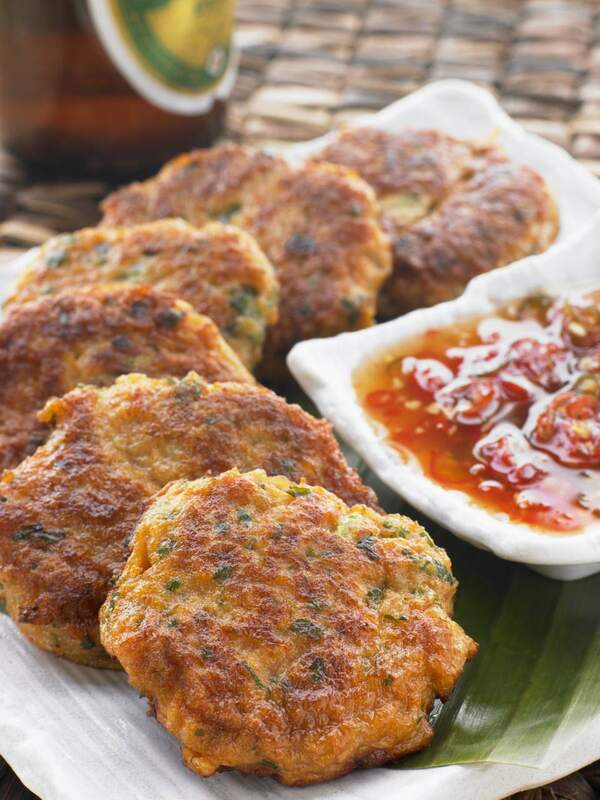 This Thai Crab Cake recipe creates wonderful crisp-on-the-outside and moist-on-the-inside crab cakes. If you can find kaffir lime leaves at your local Asian store, add them instead of lime zest - this is a key ingredient that makes these cakes sing! Panko (Japanese bread crumbs) is easy to find these days at most supermarkets, or you can make this recipe gluten-free using crushed-up rice crackers. If you like seafood appetizers and finger foods, be sure to give this recipe a try! Place crabmeat, onions, lime leaf slivers (or zest), chili, lime juice, fish sauce, oyster sauce, 1 egg, mayonnaise (if using) and 3/4 cup panko together in a food processor or chopper. Process to combine ingredients. Add up to 1/4 cup more panko and briefly process or stir to combine. You want the mixture to be moist enough to form cakes, but not so moist that it falls apart. Add more panko until you can form cakes easily in your hands. Pat mixture into cakes (I usually make them 2 to 3 inches in diameter). Place on a clean plate. In a separate, smaller bowl, break 1 large or 2 small eggs and briefly whisk. Pour 3/4 cup panko into a mixing bowl and add the garlic salt, stirring to mix. Dip the crab cakes first into the egg, then roll in the panko mixture to cover. Set on a clean surface. Pour oil into a small frying pan or wok set over medium-high heat (oil should be 1-inch deep). Heat for 1 minute or longer. To test if oil is hot enough, drop in a few panko crumbs - if they begin to sizzle right away, the oil is ready. Carefully place crab cakes in the hot oil. Reduce heat slightly to prevent overheating and splattering. Fry crab cakes 1 to 2 minutes per side, or until golden brown. Serve with Thai sweet chili sauce. You can also serve with a dollop of mayonnaise alongside the sweet chili sauce - take a little of both on your crab cake at once for a wonderful combination of flavors. To Make these crab cakes gluten-free, create your own "panko" crumbs. Just place 3/4 package of plain or sesame-flavored rice crackers in a food processor and mix until very fine.